YOU GUYS. Drop everything and buy this book. It's been five days since I read/finished it (in one sitting) and I'm still thinking about it! I'll start by telling you I'm giving this one FIVE gold stars because any book that has me wishing for more five days later is worth every star I can give it. If you're familiar with the story of King Midas and his golden touch, then you'll love this part two almost. 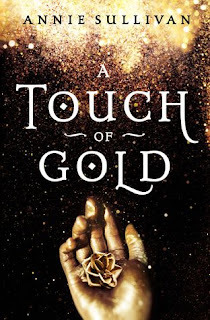 We know he turns his daughter gold but what happens after that is where this book comes in. 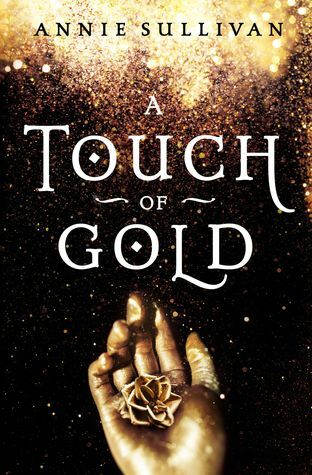 Kora is still golden, but she hasn't ever left the palace but she has to now because only she can track down her father's stolen gold before he's too weak to survive. So off Kora goes, aboard a ship with her stowaway cousin Hettie, and the suitor who has come to court her but also offers his assistant, Aris. But it's not all smooth sailing because soon enough she realizes the danger she's in from the crew members but also the realization she will eventually have to face off with a pirate named Captain Skulls. There are SO MANY plot twists in this one that more than once I found myself saying, "SHUT THE FRONT DOOR" and I couldn't stop reading it. I finished all 300some pages in one sitting because I couldn't put it down. It's a YA book so it's got a little romance but nothing extends past kissing so this is perfectly OK for a kid to read it. In fact, my almost 13 year old has stolen it from my desk already. I am so impressed with this author and her writing style, it's just a smoothly written novel with a twist on a classic. Absolutely loved it.